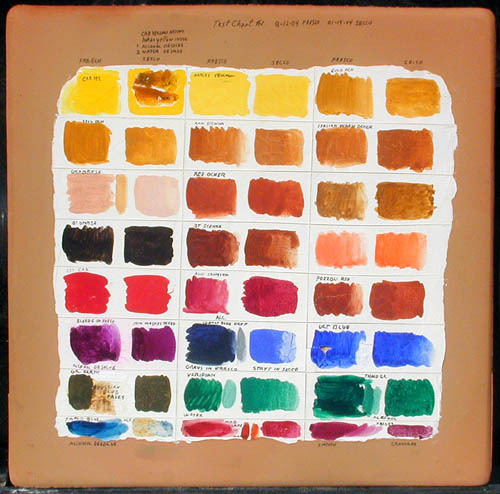 I made a fresco color chart of 25 colors on a 12" fired terra cotta tile, Test #1. 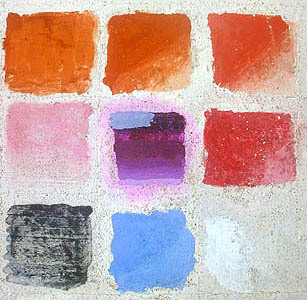 Half of each color in buon fresco and half as secco. Colors paint smoother in limewater secco, smoother yet in egg secco. Some Chemical colors dissolve better in alcohol or ammonia than in water. I was having a heck of a time grinding Thalo blue and green. They dissolved best in alcohol. The Quinacridone's dissolved better in ammonia and they did pretty good in water. The Indian Yellow B/s PY108 Anthrapyrimidine Yellow dissolved best in water and gave it's best hue. It's a good thing I had a little extra space at the bottom of the chart to test with. 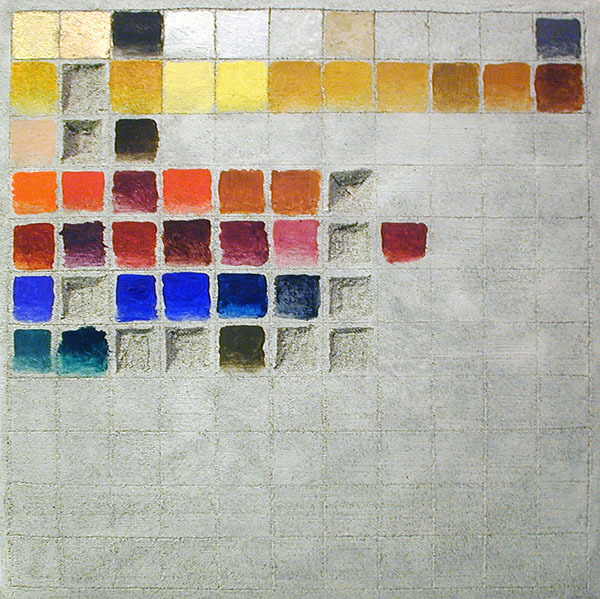 The colors are named from top left to right, each color has two chips, one fresco, one secco. 01-22-04, I started a new chart with more colors. plus a few cut out depressions for more new colors in fresco. This mortar includes sand, that's why it looks gray, it will lighten as the lime becomes whiter. Lime milk paints opaque tints, lime water makes a transparent or translucent glaze that losses it's chroma first. Later I learned it's easier and better to make tints with titanium white. To keep a color at it's darkest, use lime water. You MUST wash your brush in soap and water to remove a color. Vinegar will remove and neutralize the lime on your hands and cleans your glass palette. SECCO: Add alum to the egg to make it waterproof, or use casein. MORTAR: Add alum to the mortar to make it harden faster. The two gold's did not work in fresco, I painted over half the Pale Gold in secco on 02-05-04 with casein and Pale Gold, both worked fine. The Rich gold got a secco coat of egg plus alum to make it waterproof. 1. Rich Gold - dissolved in alcohol, left side is SECCO with egg yolk medium. 2. Pale Gold ground in alcohol, left side is SECCO with casein. 3. Vine Black, warm black. 6. Lime White pigment, warm opaque when dry. 7. Vincenza White Earth, dries the color of sand. 11. Mars Black, bottom tint with titanium white, egg yolk medium, SECCO. 2. Raw Umber lightened with lime Milk not lime water, that paints opaque tints, yellow-brown. 4. Saffron, right side tint with titanium white, left side with lime white pigment, both sides in EGG SECCO. 5. Indian Yellow Br/s ground in water, top egg yolk only, bottom left side lime white pigment and egg, middle titanium white and egg, right zinc white and egg. EGG SECCO. 6. Indian Yellow Br/s hue plus Titanium White in the middle mixed with Daniel Smith's Alizarin Crimson make a good red. EGG SECCO. 7. Indian Yellow Br/s hue plus PB15 cyan make a good green. EGG SECCO. 2. Cadmium Red Medium PR108, PR88 permanent red looks the same. 3. Lacca Di Gabanza, a warm opaque tint of magenta. 7. Ercolano or Herculaneum Earth tinted with lime paste. 8. Vermilion Genuine ground in ammonia, tinted with lime. 9. Caput Mortum tinted with lime, lower right..
1 Lacca Magenta turns brown in lime. 2 Carminium, lightened 50% in lime. 3 D.S. Alizarin Crimson PR83 Anthraquinone. A warm magenta that gets browner in lime. 5 D.S. Quinacridone. Magenta PR202, water grind. Cool Magenta. 7 Lacca Porpora, transparent purple, top left mixed with titanium white and thalo green to make the distant blue mountain color. This pigment bleeds pink in the first hours but it goes away as the lime turns white. EGG SECCO. This pink bleeding also happens in fresco, but it goes away as the lime looses it's translucency and becomes opaque white. 8 D.S. Alizarin Crimson, lime milk fresco, to store it wet dissolve it in ammonia. Egg and ammonia go well together. 9 D.S. Alizarin Crimson, ground in ammonia, egg, EGG SECCO. 10 D.S. Alizarin Crimson, ground in egg, EGG SECCO. 2. Cobalt Blue Light tinted with lime on the lower right. 3. Ult. Blue Deep, is fading fast..
4. Ult. Blue Light, is also fading after only 12 hours. 5. Thalo Blue, the best cyan blue is PB15:1, as the numbers go up the magenta hue is added. 6. Indigo Genuine, blue-gray at best, a useless color in fresco. 7. Cerulean Blue, tinted with lime in the lower right. 1. D.S. Viridian, warm opaque green light, bottom right tinted with titanium. 2. Thalo Green with limewater wash.
3. Cobalt Turquoise, tinted with titanium white in the lower right. 4. Thalo Blue, two titanium tints, the left side ground in alcohol, right side ground in ammonia. 5. Zecchi Verdaccio, a dark green earth. 6. Warm Green Earth tinted with titanium white at the bottom. Cooler than chromium green oxide. 7. Chromium Green Oxide, top lime water, middle tinted with lime milk, bottom added lime pigment they looked the same going on, in fact the bottom looked darker. The bottom tint box on the right has titanium white added. 1. Zecchi Viridian Extra, cool, tinted with titanium white in the lower half. 2. OPPOSITION, Thalo Green and Quinacridone Magenta. NEUTRAL DARK. 3. OPPOSITION, Thalo green and Quinacridone Magenta. NEUTRAL DARK and GRAY. 4. OPPOSITION, Thalo Green and D.S. 's Alizarin Crimson. NEUTRAL DARK. 5. OPPOSITION, Thalo Green and D.S. 's Alizarin Crimson. NEUTRAL DARK and GRAY. 6. TRIAD, Indian Yellow Br/s, Alizarin Crimson and Thalo Blue. NEUTRAL DARK. 7. TRIAD, Indian Yellow Br/s, Alizarin Crimson and Thalo Blue. NEUTRAL DARK and GRAY. Quinacridone Magenta Y, PR122 is a much better color than Alizarine Crimson PR38 as magenta. New Colors ordered from Daniel Smith, 4-8-4. They all have to be lime tested. They arrived 4-19-4, I'm testing them now. Permenent red, a conflicting name, a little cooler than Thioindigold red or cadmium red ground in water and oxgal. Quinacridone coral, between Permanent red (napthol crimson) and Quinacridone Magenta. Quinacridone Violet, warmer than manganese violet. Manganese Violet, warmer than cobalt violet.